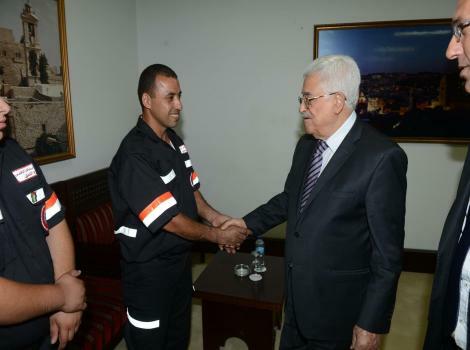 The President of the Palestinian Authority, Mahmoud Abbas, received a delegation from Burj Al-Luqluq Social Center Society first-aid unit at the headquarters of the Palestinian presidency in Ramallah. This unit provided services for worshipers who visited Al-Aqsa Mosque during Ramadan. The delegation also included people from the Red Crescent, the Arab Health Center, Nuran Charitable Association, and the First Aid Arab Union Society. President Abbas praised the role of scouts and first aid units who devote themselves to serve the worshipers and visitors of Al-Aqsa Mosque, especially during Ramadan, emphasizing that Jerusalem will not be other than the capital of an independent State of Palestine. The delegation gave the president a handful of the soil of Al-Aqsa Mosque, while the scouts gave him a seashell statue of the Dome of the Rock. It’s worth mentioning that the Head of the Presidential Office Dr. Hussein Al-A’raj, his Deputy, adv. Ahmad Al-Rweidi, who coordinated for this visit, in addition to the head of the Arabic Medical Center and the head of Jerusalemite clubs Ahmad Surur.